This entry was posted on May 17, 2013 at 9:03 pm and is filed under Action, Adventure, Science Fiction with tags 2013. You can follow any responses to this entry through the RSS 2.0 feed. You can leave a response, or trackback from your own site. Good Review Mark! This is how a good sci-fi is done. Agreed. It was very entertaining. Totally agree with Benedict Cumberbatch making for a particularly compelling villain – he almost stole the entire film in my opinion. Unfortunately I was surprisingly not as taken by this film as most others have been. To me, there was something epic missing from the piece. Maybe it didn’t need to be more dramatic, but I was rather letdown when the credits rolled. I like how you touched on that idea; I certainly am not a huge follower of Star Trek but it’s definitely important to keep this aspect in mind. I enjoyed how Abrams made it more readily available to newcomers, and the humor enhanced my enjoyment further. Maybe, just maybe….for the first time ever, I might claim this movie had too much action. I like that this can be enjoyed by people who aren’t necessarily fans of Star Trek. To me, it was simply a good movie. In that respect it was in keeping with the spirit of the last film. Looks like you enjoyed it as much as I did. Nice review. Thanks! Based on initial reactions, it seems like a big success with filmgoers. When will they stop chasing after “The Wrath of Khan”? This is now the third ‘Star Trek’ movie in a row to rip off the 1982 film. Ugh!!! Probably because many consider it to be the greatest Star Trek film ever made. I liked it quite a bit too, and right now it probably is film of the year (though 2013 has been really weak to this point 😦 ) The action set pieces here were impressive, no doubt, and Abrams lets them breathe a bit better than he did the first time out. Not without its flaws, but for a big summer blockbuster, this is good stuff! 2013 has been weak, but Star Trek into Darkness stands out even against poor competition. As far as big summer blockbusters, we’ve had Iron Man 3 & Star Trek Into Darkness thus far. We’ve still got Man of Steel which is expected to make a ton of money too. Whether it will, remains to be seen. Nice review. I hope to see this soon. You’ve got time. Based on the opening weekend box office, it should play throughout the entire summer. Great review, Mark! I had a lot of fun with this one and it just flew vy so fast. I wanna see it all over again! And Cumberbatch’s voice is so awesome. But I think he had a little help there, don’t you? Like it was magnified or something. Love the way the logo’s looking – especially here on Mark’s site with the black backdrop! Thanks! And yeah, it looks amazing over black too. I didn’t think he had electronic help, but who knows?! Perhaps his voice was magnified to make him seem more intimidating. Mark, I felt the opposite! I didn’t think it had enough character arc to warrant the emotions post-climax. (The glass scene.) And not just between Kirk and Spock. I wanted more development between Uhura and Spock, Kirk and Pike, and Kirk and Harrison. As expected, though, the visuals are incredible. I liked the action scenes even though only one or two have their own stamp. You weren’t touched by the late hour discussion between Uhura and Spock about his emotions? It was kind of manipulatively written so I can understand why you might resist the sentiment. Mark, I haven’t read the review yet, but saw how high you rated it. I have not seen part one and I don’t really want to; would I have to see the first one to enjoy this sequel? Or could I go in cold and still like it? And I’m not big on science-fiction. I’ve never seen a Star Wars or a Star Trek film b/c I typically hate those kinds of films and are just bored out of my mind…but I have seen nothing but GREAT reviews for this Star Trek sequel, and so may consider giving it a try – but since you now know how I don’t typically like sci-fi do you think I may like this one? You won’t like it. All of those science fiction films you mentioned got great reviews. So if you had no desire to see any science fiction before, there’s no reason for you to see this one. Sounds like Into Darkness has already made your top ten list haha. Great review Mark, even if I wasn’t nearly as emotionally connected to what Abrams was selling as you were. I obviously enjoyed this but I kind of hope they write a completely new story for the next one. They should push themselves and not do another re-imagining of a previous work. I saw this yesterday night in IMAX 3-D. By far the most crowded showing I’d ever been to. I enjoyed the movie, and I agree with most of your points. My only complaint is that there was so much story to follow, and the pacing went numb near the end. Too much story? I felt the plot was rather simple. Terrorist makes threat. The crew of the Starship Enterprise must stop him. What I meant was there was so much focus on the arguments between Uhura and Spock / Spock and Kirk. As a die hard Trekkie me and my friend were disappointed and downright annoyed that it wasn’t a new story but a major borrowing from classic Trek. Yes as I said on Facebook the expansiveness of the ships and space was a marvel to look at and I loved the interplay between the main cast especially Karl Urban but a new story was left at dry dock so it didn’t boldly go where a script should go. Sadly I give it on 3 stars. It’s been so long that I didn’t realize it was a remake until the moment when Benedict Cumberbatch as John Harrison made that announcement. He didn’t have much in common with the character we knew from the past. And what about Admiral Alexander Marcus, the high-ranking Starfleet officer? He was a villain too. I think Abrams sufficiently altered the mythology to create a new reality in the Star Trek universe. I know it’s a little early to say, but this is by far my favorite movie of the year. We’ll see how the rest of the year plays out. I loved the action, humor, special effects and acting. It has it all. It’s great when you can capture the emotions of the characters and follow the story. I too want to mention Benedict Cumberbatch. He had an awesome and effective voice. I just loved it all. You’re not the first to name this as best of the year. I like a few movies more, but as far as blockbusters go, it was about as good as it gets. great review. i have decided to see this tomorrow. plan on seeing it in 3D because that’s the only showing that will best fit my schedule. hope the 3D doesn’t negatively change the experience. Btw, i checked the settings on my blog and everything seems normal. am not sure why you’re not receiving the emails. i post on mondays, or i can let you know as well thru comments on your reviews of the same movie. Thanks. I checked and am subscribed. Hope you enjoy it. It’s my favorite blockbuster this summer. Awesome review. Really glad you liked this. The real star of the show is Benedict Cumberbatch, making a perfect villain. He made for a much more fleshed-out and memorable villain than Eric Bana’s Nero. He is intimidating in individual ways and managed to surprise me throughout. I also loved the way he executed his plan, it showed more cutting edge creativity than most modern blockbusters. 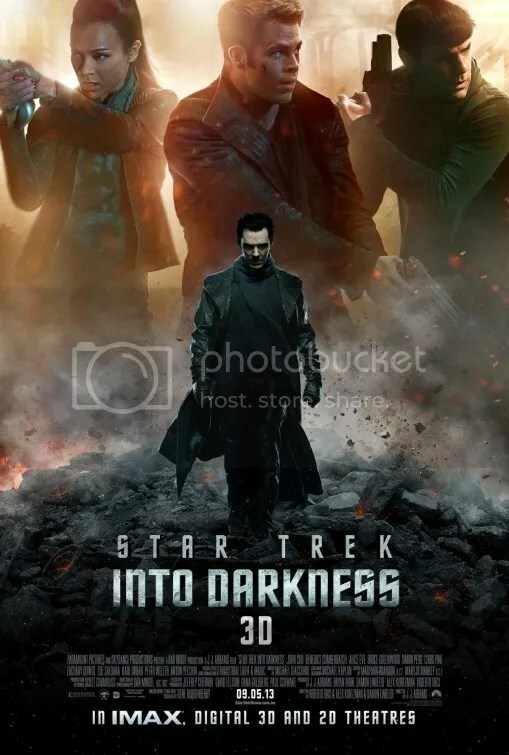 I enjoyed Benedict Cumberbatch, He definitely is superior to Eric Bana’s villain of the previous film, but perhaps a better comparison would be the original Khan, Ricardo Montalbán. His memorable portrayal is hard to forget.